What You Need to Know About Surveys4Bucks Before Joining! At first sight, Surveys4Bucks looks like a normal survey site, where you can earn by taking surveys and by doing other online tasks. But do not let that fool you. It is nothing like an ordinary paid survey site. Does that mean Surveys4Bucks is a scam, or just a site you have to be lucky to make money on? Well, that depends on how you define it. What I mean about that will become clear during this Surveys4Bucks review, where I will give you all the details about what the site really has to offer. After reading the review, you will easily be able to judge for yourself whether it is a site you want to join or stay away from. 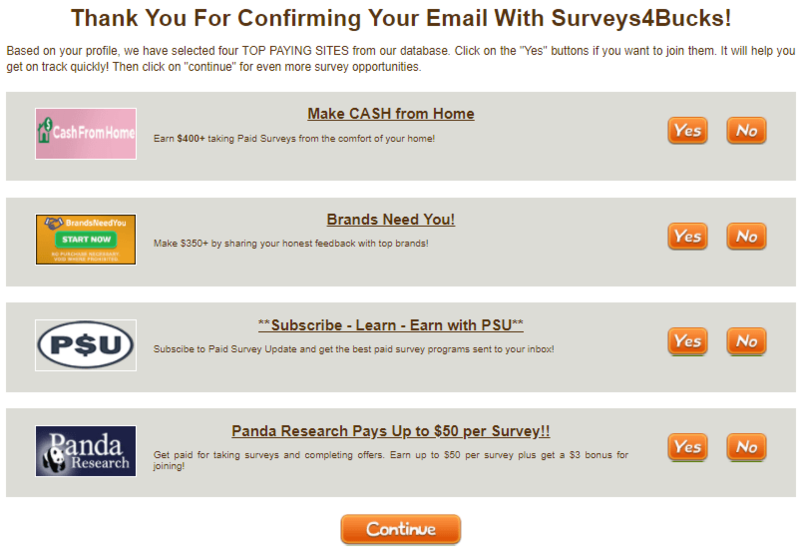 What is Surveys4Bucks and what does the site offer? When you first come to Surveys4Bucks’ website, you will see that it offers many of the same opportunities most other survey sites offer – you can get paid for surveys, to rate customer experiences, to participate in focus groups, surf the web, shop online, play games, and more. It even has a good-looking FAQ site, where it answers all the regular questions paid survey sites usually do. Everything looks nice and it looks like any other good survey site. That does however change once you decide to join and sign up. When you first join, you do not even have to make a password. You just have to give your name and email address. This is very strange for a site, where you are supposed to be able to make money and have your earnings paid out. Let me reveal right away what I assume the reason for this is. Surveys4Bucks is not an actual member site. They are just interested in getting you in to the portal and sign up for the offers you will be presented for. You are not really going to become a member with an account, where you can see your earnings. If you leave the site, you have to go through the same sign up procedure every time you come back to the site. There is no option to login to the site with an existing account. So do not expect you really become a member. But what opportunities will you then get through the sign up process and after signing up? Once you have given your email and name, you will be presented to a sign up offer. In my case, it was an offer to learn to do email marketing and make $3000 in 30 days without any prior knowledge. I always become suspicious when I see offers like this. I know by now that you do not just learn to make that kind of money in 30 days. But I still clicked out of curiosity and to be able to make this review and tell what Surveys4Bucks really offers. What you will get is not the actual offer. You will be taken to some kind of spammy website with a “winner” form or great Bitcoin offer, or something similar. It had nothing to do with the offer that was shown to me. It was just a spammy pop up trying to get me to sign up for something else or give up my personal details. One of the “get-rich-quick” offers I got when signing up. After I then clicked continue, I was presented to another screen with sign up offers. As you can see on the picture below, it says that these offers are recommended to me based on my profile. That is very strange since I had not given any details about myself other than my email. It seems more like a trick to try to make it look personal and create trust. Examples of more offers during the signup process. After clicking continue, I was presented for a few more offers. It was exactly the same again. No real offer, just links to spammy websites. After finally getting to the member area, I was curious to see what I would then find. Of course, I did not have high expectations after the sign up process, and I was right in not having high hopes. In the “member” area, you will find a menu with a few different ways to earn money. Each of the menu points have a site with different offers. Some of the offers are for very good services. I for example got an offer to sign up for Swagbucks which is a legit and very good survey site. Some of the survey sites you can join – none of the links did however take me to the actual survey site. However, once again the links did not take me to the offers that was presented, but I was instead taken to a website with some kind of “get-rich-quick” offer or a spam pop-up. I went through all the menu points, and I did not find one single link that took me to the actual offer. I was even in one of the links taken to the survey site “Take Surveys for Cash“, which is a survey site I have previously made a review about (and not a very positive one). One of the many “fast money” offers I got on Surveys4Bucks. So that is what you will find on Surveys4Bucks – a lot of links to offers, but rarely the offers that are presented to you. As you can see, I am not impressed by the opportunities I found on Surveys4Bucks. But what kind of payout methods does it offer? According to Surveys4Bucks itself, you will not as such get paid from Surveys4Bucks, but directly from the companies you sign up with through their website. Usually, you will then be able to get paid in check or through PayPal. The problem is however that you do not really get any opportunities to sign up for any survey sites through Surveys4Bucks. You are just taken to all kind of other offers. 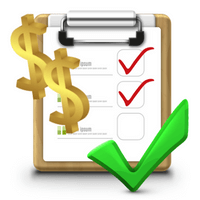 So it does not really matter what kind of payout methods Surveys4Bucks says that are available, as you do not really get a chance to sign up for any sites where you can earn by taking surveys. You will not as such be able to make any money by becoming a member of Surveys4Bucks. I cannot say for sure that you will not be able to make any money by taking some of the offers. I have however not seen any offers there that I would spend time or money on. So do not get you hopes up too high. There is however one way you can earn directly on Surveys4Bucks. The site has an affiliate program you can apply to become a part of. That means you would get paid a commission for recommending people to join the site. However, as Surveys4Bucks is a not site I would recommend, I would personally never participate in promoting them just to make a commission. So it is not a road I recommend. You can join Surveys4Bucks no matter where in the world you live. As the site in my experience seems to be mostly interested in offering you spam links, it obviously also has no restrictions in relation to who can join. Many of the survey sites that are mentioned on the site are however only for people living in the US. But it does not really matter, because none of the links leads to the actual survey sites anyway. So you can join no matter where you live, but no matter where you live, you should no expect to get much out of joining. Usually, I believe it is very important that a survey site provides good customer service and has a fast support service. When it comes to Surveys4Bucks, it does not make much of a difference in my opinion, as it does not really give you any real opportunities, and why would you then want to contact support. There is however a contact form on the website. There is a contact form – if you want to advertise or become an affiliate. The contact form clearly shows what the focus of Surveys4Bucks is. It says that you can contact them, if you want to advertise, or if you want to become an affiliate (and thereby promote them). It does not say anything about you being able to get help or support, if you should need it. It is a clear sign that Surveys4Bucks is all about making money on advertising and not about helping its members. Final thoughts – stay away from it! I think it is clear by now that I do not really like Surveys4Bucks and the opportunities there. But let’s sum up the pros and cons to give you a clear overview why that is. To be honest, the only positive thing I can say about Surveys4Bucks is that at least they do not try to charge you a fee to join. But with the lack of opportunities on the site and the huge amount of spam links, it is in my opinion a big waste of time to join the site and spend any time there. If you have any comments, any questions, or if you have any experiences with Surveys4Bucks yourself, I would love to hear from you in a comment below. Surveys4Bucks looks like a normal paid survey site. It does however not provide any real value but instead a lot of spam links. In my experience, you will not find any real survey opportunities here. Thanks Arabelle. Glad you liked it. Thanks for the info. One more to cross of. Thanks for the feedback and for stopping by Mary-Ann.